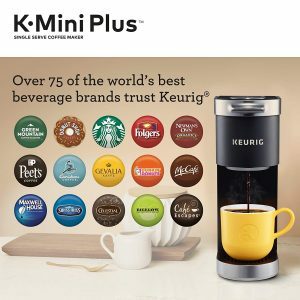 Keurig K-Mini Plus is a mid-2018 release compact single serve K-cup pod coffee maker with a sleek and modern design. It gives you two coffee brew size options of 6 and 12 ounces. You can store up to 9 K-cup pods in it. The rating is 4.1 out of 5 stars by 25 customers on the day of this review and we’ll have a look through the answered questions as well. You can purchase it in either matte black or cardinal red with a price difference of about 20 dollars at the time of this review. The K-Mini Plus fits anywhere comfortably and can have a permanent place on your kitchen counter easily as it is only 5 inches wide, plus the pod storage. It is actually the slimmest coffee brewer that came out on the market by Keurig so far. It lets you have a bolder brew with a more intense flavor and stronger taste, by simply pressing the Strong button. If you want a really strong coffee, select the Strong button, select the smallest brew and use a very strong flavor K-cup pod. This being a small unit that weighs only 5.91 pounds and measures 12.1H x 4.5W x 11.3D inches, the water reservoir is also small with one cup capacity. The advantage is that you’ll be using fresh water each time you brew coffee. This water tank is conveniently detachable for you to fill and clean easily. There is a cord storage at the back which will come in handy for easier transport and storage as well as less clutter on your countertop. The pod storage part will fit into the brewer when you move the coffee maker and will also save on counter space when you’re not making coffee. It runs pretty quickly with the ability to give you coffee in just two minutes. Brewing time will be longer if you choose the Strong option. You can only use the Keurig K-cup pods with this brewer, and not the Vue, Rivo, K-mug or K-carafe pods. You also have the option to use the Keurig My K-Cup Universal Reusable Coffee Filter, if you don’t want to brew a coffee pod every single time. And you can purchase this filter separately via Amazon.com. You just need to remove the 2.0 adapter which is located at the bottom and the K-cup holder and it should fit in nicely. As a travel mug friendly brewer you can fit a 7” travel mug after removing the drip tray. The size of your brewing will depend on how much water you add into the water reservoir. It will be either 6 or 12 ounces. 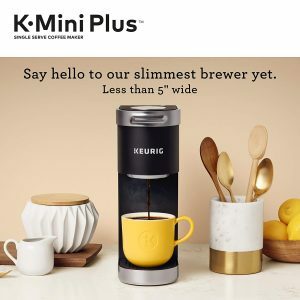 The K-Mini Plus has the auto-off feature and the brewing unit will turn itself off one and a half minutes after your last coffee brew. It has a preset brew temperature for the optimal brewing and to get the best out of coffee pods. And the temperature of the beverage you get is between 170 and 190 degrees Fahrenheit. It has a 1470 watt power motor (120 Volts and 60 Hertz) and this maximum consumption can occur only when it is heating. It will use up only up to 15 watts when it is idle. Please note that there is no built-in water filtration on this unit, and none of the Keurig machines have it. It runs generally quietly but you will hear a bit of noise during the heating and brewing. You may use vinegar for descaling or alternatively the Keurig descaling solution, every 6 months or so. It is super easy to operate, as you simply pour some water into the detachable water reservoir, insert the K-cup pod of your choice and press the brew button. Your freshly and deliciously brewed coffee is ready to be served in just a couple of minutes. You can also make hot chocolate, tea and iced beverages with the K-cup pod of your choice.